I may want nothing more right now than to crawl into a corner and die from exhaustion after an exhilarating dose of TGS this past week, but there are still games to play—namely, Bayonetta 2 which came out here in Japan yesterday. So join me as I play for as long as this broken body of mine will last! Update #1: Stream complete. I played the entire game in one sitting. Took be over 10 hours. You can watch the first hour or so of the stream below. 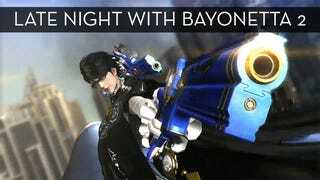 Bayonetta 2 was released for the Nintendo Wii U in Japan on September 20, 2014. It will be released in the US and Europe on October 24, 2014.